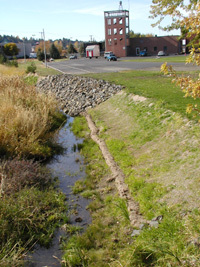 This project stabilized a highly impacted area of the streambank and added a riparian buffer. Due to the confined nature of the stream at this point and close proximity to the Moscow Fire Station a small area of riprap was placed in conjunction with coconut fiber Biologs along the upstream portion of the project. 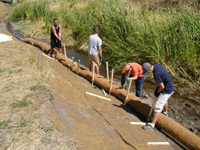 Erosion control fabric was installed on the remaining portion of the streambank. The Biologs were planted with native herbaceous plugs. All exposed streambanks were seeded with native grasses and woody shrubs were planted on the banks and at the top of the streambank. The stream segment had nearly vertical, slumping, eroding streambanks contributing to the sediment load in the creek. There was also a lack of native woody vegetation close to the creek for shade. Paradise Creek had been dredged in this reach many times, which added to its degraded state. Pounding BioLogs at the Firehouse: Many University students helped to install BioLogs at the project next to the city of Moscow Firestation #2.